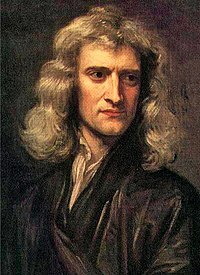 Fisiceoir agus matamaiticeoir Sasanach ba ea an Ridire Isaac Newton (4 Eanáir, 1643 - 31 Márta, 1727). D'fhoilsigh sé a mhórshaothar Philosophiae Naturalis Principia Mathematica ("Prionsabail Mhatamaiticiúla na Fealsúnachta Aiceanta") sa bhliain 1687. Chuir na dlíthe a nocht sé sa saothar seo bonn faoi dhul chun cinn na fisice is na meicnice go dtí an lá atá anois ann. Mhínigh a chuid dlíthe, ar nós dlíthe na gluaiseachta is dlí na himtharraingthe, fithis na reann timpeall na gréine agus fithis na gealaí timpeall an domhain. Cheap Newton agus Leibniz an mionchalcalas timpeall an ama céanna agus go neamhspleách ar a chéile. ↑ "Biography of Isaac Newton" (Béarla). Dictionary of Scientific Biography. Dáta rochtana: 2008-11-28. Tugadh an leathanach seo cothrom le dáta an 30 Márta 2017 ag 22:11.